Sky is a minimal, center aligned, CSS-based (no tables), multi-column layout theme, with Color module support (7.x only), that uses HTML5, CSS3 and the 960 Grid System. Port of this theme to the Fusion theme system with tons of new features is up in the 3.x branch! The Fusion base theme and Skinr are required for the 3.x version. Acquia Marina is an advanced theme developed by TopNotchThemes in partnership with Acquia for their Drupal distribution. It contains the same kinds of features you’ll find in our other Drupal themes. Zero Point is an advanced theme developed by Dr. Radut to be ideal for a wide range of sites. 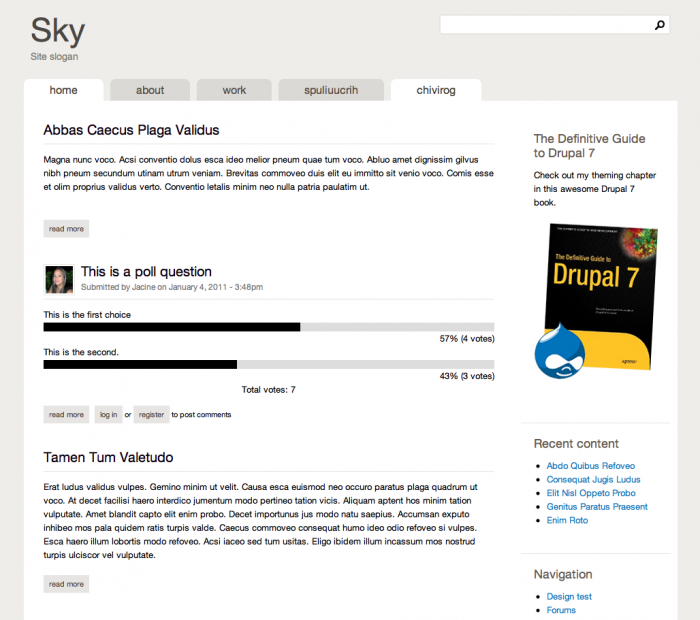 It contains the same kinds of features you’ll find in our other Drupal themes, plus many more. The theme validates XHTML 1.0 Strict / CSS 2, and it is cross-browser compatible; works perfect in Firefox, IE 6, IE 7, IE8, Safari, Opera and Google Chrome. BlogBuzz I & II different by style. So pick your favour, we support both. Simply Modern is a table-less, CSS driven design sporting an advanced feature set. Magazeen is a cool and modern theme with a stylish colour scheme, originally designed for WordPress by WeFunction Design Agency, distributed by Smashing Magazine and originally ported to Drupal by zinv. Agregado was originally designed by Darren Hoyt and Matt Dawson for WordPress and commissioned by the folks at Smashing Magazine. Ported to Drupal theme by Leow Kah Thong.